This chapter examines Andrew Holleran’s The Beauty of Men (1996), a work that parallels AIDS and aging as trajectories of decline while also exposing and critiquing the idealization of success, productivity, and intergenerational legacy. 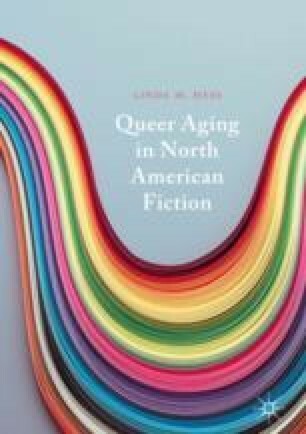 Hess argues that despite the protagonist’s idolization of youth, the narrative differs significantly from previous representations of gay aging. The Beauty of Men not only features a middle-aged (rather than a young) gay protagonist but also presents a new form of queer resistance by turning the protagonist’s profound depression into a stance of defiance. Building on critical views by Angela Jones and Sarah Schulman, the author reads the protagonist’s inertia as a productive intervention into normative ideologies of aging. Dean, Anne. 2017. AIDS Memorial Quilt to Return to Nashville for the First Time in 15 Years, September 29. https://www.artinstitutes.edu/nashville/about/press-releases/aitn-aids-memorial-quilt-to-return-to-nashville-for-the-first-time-in-15-years. Accessed 4 Jan 2018. Kheenen, Owen. 1996. The Dance Continues: Catching Up with Andrew Holleran. Owen Kheenen Interviews. Queer Cultural Center. http://www.queerculturalcenter.org/Pages/Keehnen/Holleran.html. Accessed 23 July 2015. The AIDS Memorial Quilt. (2018). The AIDS Memorial Quilt: The Names Project. http://www.aidsquilt.org/about/the-aids-memorial-quilt. Accessed 23 Feb 2018. Timeline: Milestones in the American Gay Rights Movement. n.d. PBS. https://www.pbs.org/wgbh/americanexperience/features/stonewall-milestones-american-gay-rights-movement/. Accessed 12 Feb 2016.